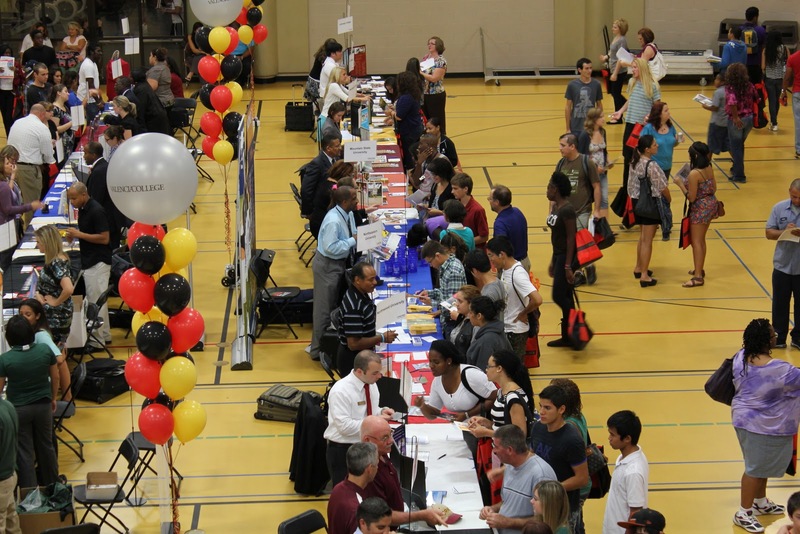 Both Valencia’s Osceola and East campuses hosted “College Night 2011” events last week with more than 120 University's from around the nation sending representatives to speak with students at each perspective campus. Valencia was the main host site for Central Florida which attracted the attention of thousands of high school and college students from around the area. The purpose of College night is to offer any student looking for information about colleges they are interested in attending and speak face to face with individuals representing that institution. Many high school students from around the area are attracted by teams Valencia sends out into the community and talk to student about what the college offers. “This event definitely helps students to check out different schools, find out weather they qualify, and what the steps are to apply and hopefully get enrolled,” said Jessica Morales, director of Transitions and Enrollment for Valencia College. Attracting potential student to attend Valencia is another primary goal of this event. Not only are students invited to walk around the campus and see what is offered, but they are also informed about extra on campus groups, scholarship opportunities and general campus information if requested. Florida’s colleges and many other stand-out university from around the nation were featured like UCF, UF, Cornell, Yale and more totaling over 120 different institutions. Tables and rooms were provide to allow representatives from the campus to answer questions and provide information to potential students. “I’m here sharing my own personal experiences, trying to give some advice and guidance and letting students know what Yale is looking for,” said Michael Brodsky, president of the Yale Alumni Association of Central Florida. There are also special focused programs like the duel language for Hispanic students offered at the University of Tampa. “We offer bachelors and masters degrees that are taught in 50 percent English and 50 percent Spanish, for any student seeking this type of specialized degree,” said Luis Martinez, a volunteer from UT. Many of the high school students interested in larger University featured at college night still want to start their education at Valencia. “Valencia is a really nice college, and I want to study sociology, and travel the world one day comparing different countries like India and America,” said Danny Blake, a local high school senior. Current Valencia students set to transfer after graduation were also looking at the variety of featured campus. “I’m looking for a local college and my top two picks would have to be Rollins College and Stetson University, I’m buying a house so I need to stay in the area,” said Jeff Morris, executive vice president of Pi Theta Kappa on Valencia's East Campus. Campus groups like Pi Theta Kappa at Valencia were also featured during college night. Other groups like student government, Club 3:16, African American Cultural Society, and more were speaking to potential student looking to increase future membership. Actually visiting the schools that end up on your final list will help you get a better idea of what they are like and really know if it’s the best fit for you or not. Informational events like college night can be a strong step for students planing their educational future. For more information of what Valencia offers go to http://valenciacollege.edu/futureStudents/.